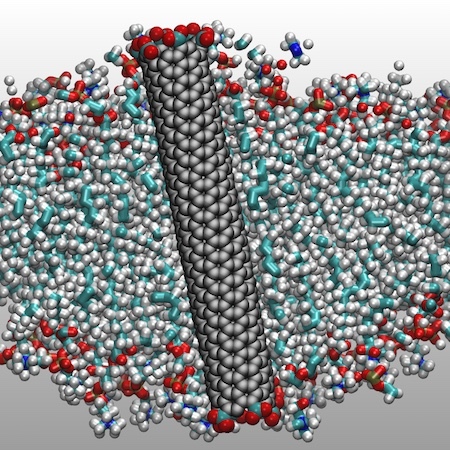 A rendering shows water molecules (red and white) travelling in single file through a carbon nanotube porin (orange cylinder) embedded in a membrane (blue). A new study published in the journal Science may have major implications for the future of water purification. Professor Aleksandr Noy and his research team at Lawrence Livermore National Lab found that carbon nanotube porins (CNTPs) — hollow cylinders made of pure carbon that resemble microscopic drinking straws — can transport pure water across barriers while excluding impurities. The study also shows that CNTPs do this better than any material known to science. Approximately 100,000 times thinner than a human hair, CNTPs are so narrow that liquid water has to rearrange itself into a single-file chain of water molecules in order to pass through. This helps CNTPs separate water from dissolved salts, even at salinities higher than seawater. Materials that employ microscopic pores to separate water from contaminants are not new. Most technologies used for desalinization work on this principle. Even nature’s solution to the water purification problem, the aquaporin, works much the same way. Aquaporins are cell-surface proteins found in everything from bacteria to humans. They’re nature’s water conduits, regulating the flow of water in and out of cells. Their unique chemical structure allows them to distinguish water molecules from other particles, resulting in highly selective water transport. Because of this, researchers have tried to design aquaporin-based water purification systems, largely without success. These technologies are difficult to scale. Plus, proteins degrade over relatively short time spans, making aquaporin-based technologies unstable. A rendering of a carbon nanotube porin (gray) embedded in membrane. These shortcomings inspired Noy and colleagues to search for synthetic pores that were just as selective with none of the drawbacks. Carbon nanotubes seemed an obvious choice. “We created something that looks and works like a protein, but it’s stable since it’s a carbon nanotube,” Noy said. Other groups previously synthesized carbon nanotubes that could transport water, but none were as effective. That’s partly because earlier generations of nanotubes had diameters in excess of 1 nanometer. CNTPs, with a diameter of 0.8 nanometers, are much closer to the 0.3 nanometer aquaporin channel. This structural similarity leads to functional similarity, with CNTPs behaving a lot like aquaporins. Both require water to pass through in a single-file chain, and both exploit structural properties to deny passage to salts and small molecules. But CNTPs are more than just an improvement over larger, less selective nanotubes. CNTPs are six times more effective than aquaporins at water transport. That’s because aquaporins produce friction between water molecules and the channel walls. CNTPs, on the other hand, have very low friction. CNTPs have another unusual property. Under certain conditions they can transport charged particles, with researchers controlling the direction of the current. This means CNTPs can be induced to behave a lot like an artificial nerve signal. However, Noy and colleagues emphasize that much remains to be studied. UC Merced graduate student Yun-Chiao Yao co-authored the study. Additional co-authors include Ramya Tunuguntla of LLNL, Robert Henley of LLNL and Northeastern University, Tuan Anh Pham of LLNL, and Meni Wanunu of Northeastern University. Funding was provided by the U.S. Department of Energy Office of Basic Energy Science.